Known as the English Riviera, popular for its mild climate, famous for its award winning beaches and iconic palm trees. Torbay is the collective name for Paignton (my home town), Brixham & Torquay and has more attractions than any other resort in the UK and is also a Global Geopark. Known locally as the bay of dreams, I count myself lucky to live in such a beautiful place and call it home. Torbay’s sandy beaches, mild climate and recreational and leisure attractions have given rise to the nickname of the English Riviera. It provides a natural escape for large ships during rough weather and very few days go by when there aren’t some vessels anchored for shelter or awaiting orders. One thing you are bound to noticed around Torbay is how red the soil is. This colouration is due to iron chemicals, which is only found in deserts. These chemicals were released from overlying desert rocks that then passed down into the Devonian rocks beneath, staining them red. The Devonian period was about 395 to 345 million years ago. It is called Devonian because Devon was the first place that these rocks were studied in great detail. The Devonian slate has eroded over time to become the red soil that you find here today. You may come across some pink sheep in the fields around the bay, as hilarious as it looks it is just from the dust they kick up while roaming. Torbay is built on a desert, thankfully though these days the climate is not as hot as it was when the rocks were formed. Torbay has been twinned with Hameln in Lower Saxony, Germany since 1973 and with Hellevoetsluis in the Netherlands since 1989. With finding the oldest example of human bones and tools of a modern human in Europe, dating back to 37,000–40,000 years ago, Torbay may have been inhabited since Paleolithic times. 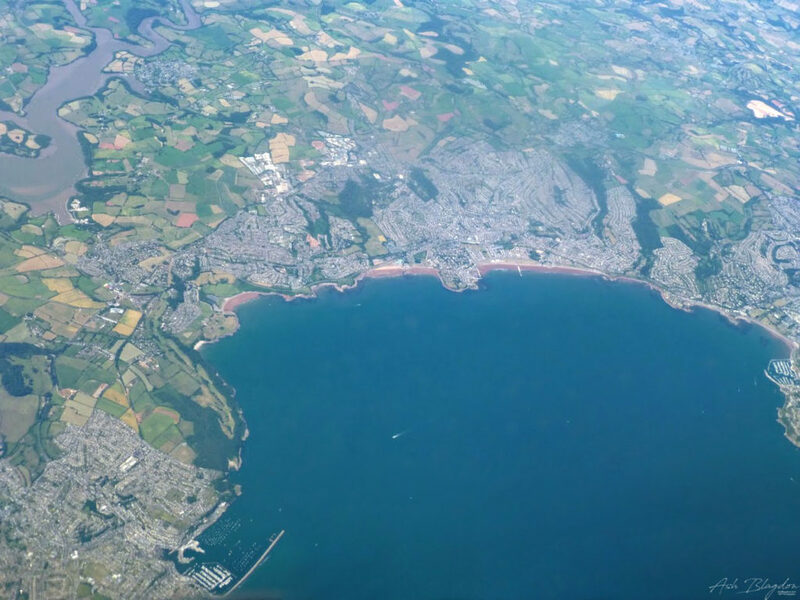 Torbay contains a total area of over 80 hectares of Seagrass (Zostera Marina) equivalent to 110 football pitches which is 30% of the whole of Devon’s Seagrass beds. Camping, Hire a static caravan or bring your own camper or tent for as little as £11 a night at Widdicombe Farm Touring Park, Widend Touring Park, Whitehill Country Park, Beverley Holidays or Waterside Holiday Park. Hostel, £19.33 a night Torquay backpackers is your only option. Linen included, free parking and free wi-fi. Hotel, Again there are many from the budget Travelodges, Premier Inns and then the luxury 4* hotels like the Palace, Grand or Imperial. Prices start from £40 – £150 a night. For just a few pounds fish & chips are the traditional bite, just be aware of the seagulls. Plenty of places for a kebab, Indian or Asian food can be found for £6 at lunch times. Always Wetherspoons for a quick cheap meal. A sit down meal at a restaurant with table will probably cost you from £25 for a main course. (Eating out at restaurants will soon put a dent in your wallet, so you’ll want to avoid doing so all the time.) Best places to buy and cook your own basic groceries are Sainsbury’s, Morrison’s, Lidl and Aldi. If your hungover or just feeling really lazy then there’s Yeti Delivery that will pick up a takeaway and bring it to your door. Ferry, There are a few, but for just £2 and 20 minutes, you can travel between the 3 towns. Check out We Ferry. From all the beaches, the coastal paths, zoo’s & steam trains, there’s much to do in and around the bay, check out the individual town pages for a more thorough guide to Brixham, Paignton or Torquay. With so many great places in all three towns I couldn’t list them all in one place, so for a more thorough guide on where to go check out the town guides Brixham, Paignton & Torquay. Have you been to Torbay? Where's your favourite place to visit? This is very satisfactorily written. The article was informative to elocutionists who possess a great value for articles. We look forward for even more of the same. He has outlined each and everything very nicely and briefly. Hello! I’m at work browsing your blog from my new iphone! Just wanted to say I love reading through your blog and look forward to all your posts! Carry on the excellent work!